Location: West of Graz, Austria. Continue 11.9 kilometer south on Hwy. 78, turn right here into the small village of Obdach. This turnoff is just before Hwy. 78 enters a tunnel. Continue into Obdach and turn right at kilometer 12.3, following signs for Wolfgang. Continue on the main road towards Wolfgang to kilometer 19.3, make a sharp left (the main road curves right) and enter a smaller road to the Sabathyhütte. Keep left at km 20.4, stay on the paved road as it climbs to the Sabathyhütte at kilometer 23.5. This is the trailhead, location N47:05.229, E014:36.038, elevation 1611 meter. 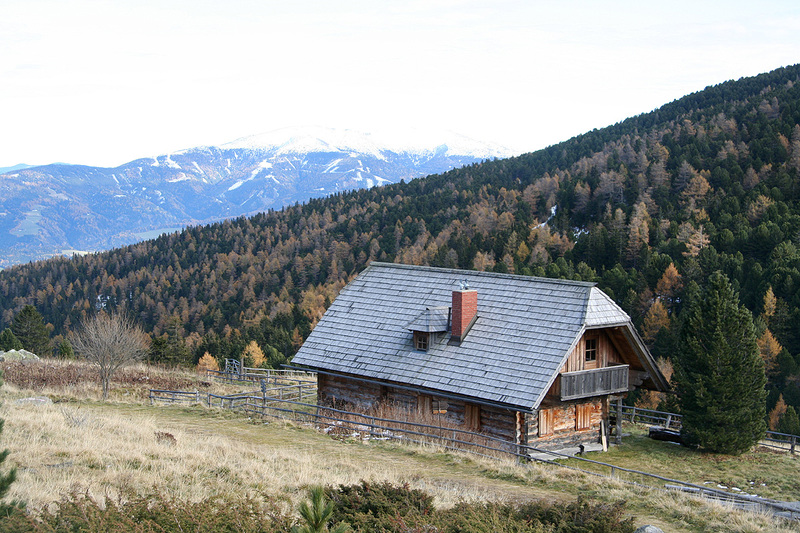 Route description: From the hut, head left (when facing uphill) along a dirt road that is signed to the Linder Hütte. This road first climbs a little, then crosses another road. Go straight, the left fork heads downhill, while your path continues fairly level. 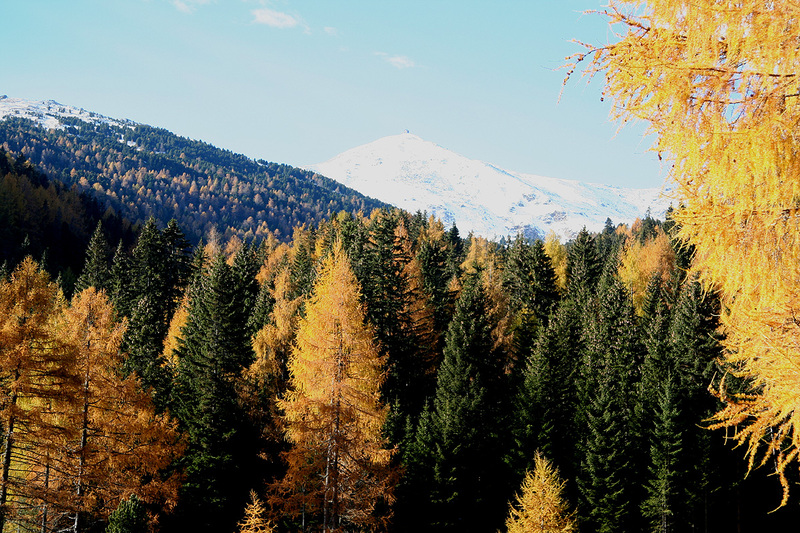 Follow this road, before long you will arrive at the Linder Hütte, there are trail signs nearby. Leave the road, as you go right and a bit more uphill, following the trail with a sign for Zirbitzkogel. The trail now crosses a small creek, then climbs gently uphill and out of the forest. 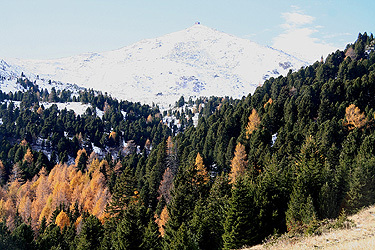 Zirbitzkogel with the summit hut is now in clear view. The trail climbs to lake Lindersee at 2051 meter. Pass this small lake on its left side, what remains is a slightly steeper climb to the summit. The ridge above connects Zirbitzkogel with a subsidiary summit further right. 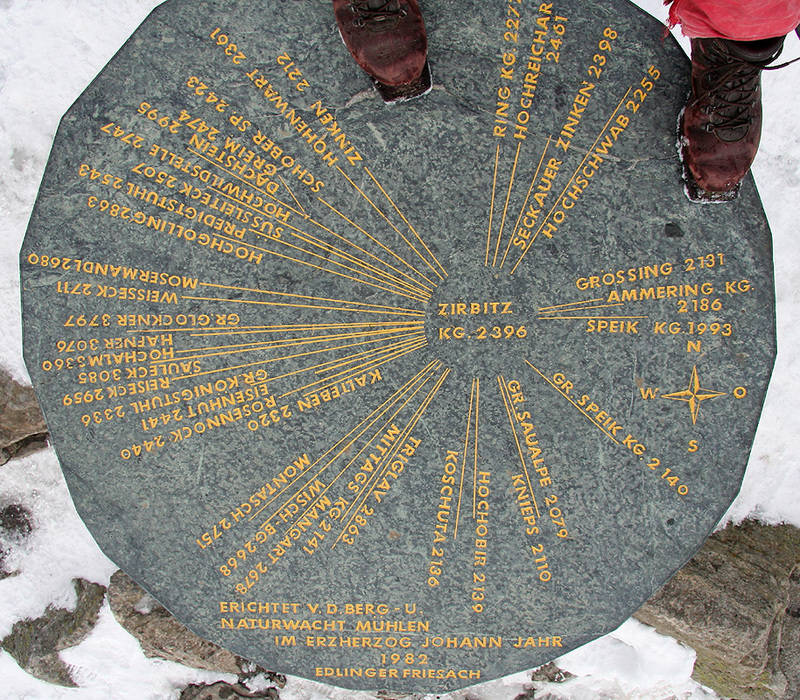 This lower summit, hosts various weather monitoring instruments. 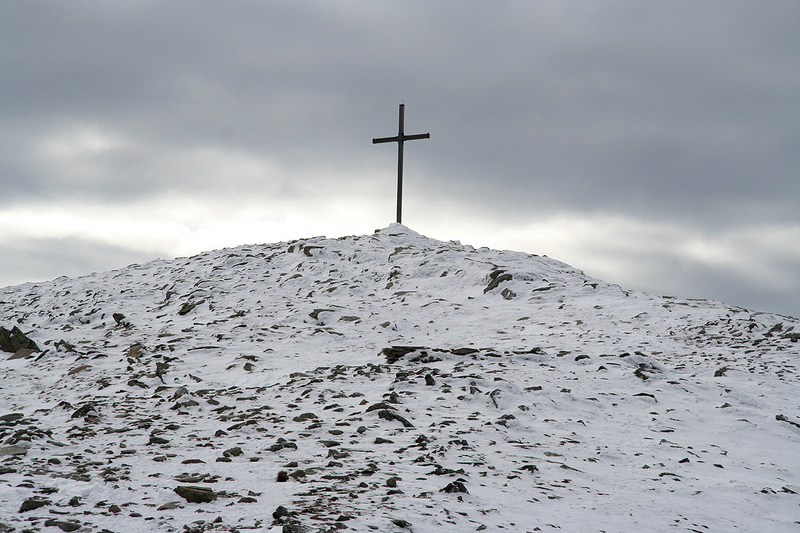 The summit is clearly identified by its summit cross while the summit hut sits a bit lower to the left as you approach the top. Comments: I left Linz at 0700 and had a nice drive to St. Michael, then in the direction of Knittelfeld. I made a mistake by taking a city exit and subsequently got lost among smaller streets. One should just stay on the big road and locate the signs for Hwy. 78. 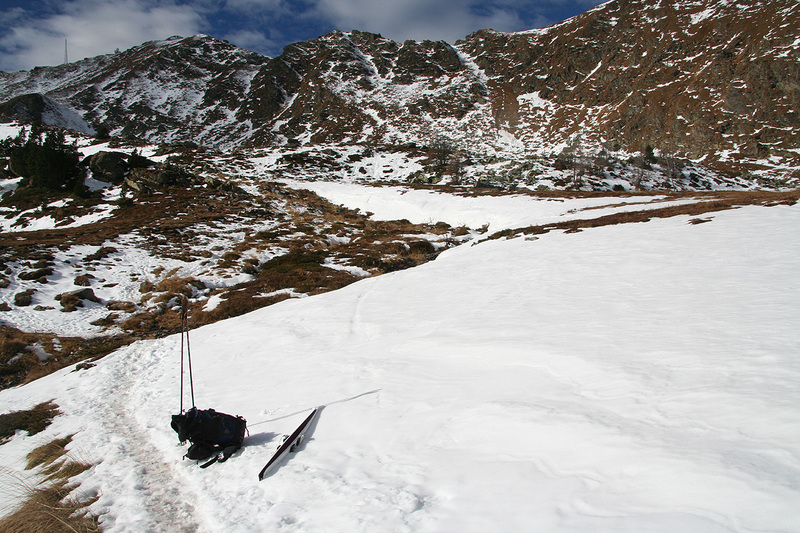 I left the car with skis on my backpack at 1000, arriving at what looked like continuous snow around 1050. My first ski-trip in Austria. 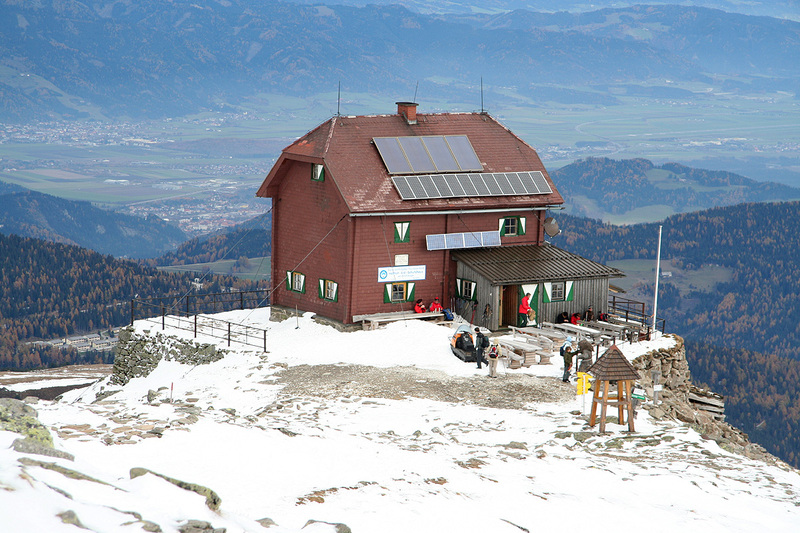 Unfortunately, the snow cover was still a bit inadequate, but I could ski from this base below the Lindersee lake and all the way to the summit. The weather was not quite as good as promised, so after the normal photo session, I headed down to the summit hut. Quite a few people there, the kitchen was very busy. I ordered bergsteigersuppe (Soup for mountaineers) and a coke. Leaving at 1245, I quickly decided to give up skiing back down, there were just too many (sharp) rocks everywhere. Walking back down, I was at the trailhead at 1350, a little over an hour. 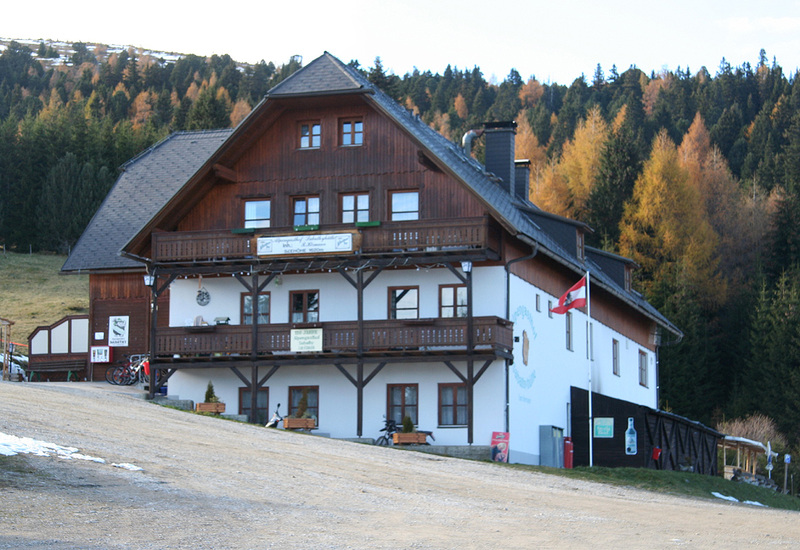 I had planned to climb Ameringkogel the next day and thus headed over to the Salzstiegelhaus, my next trailhead. 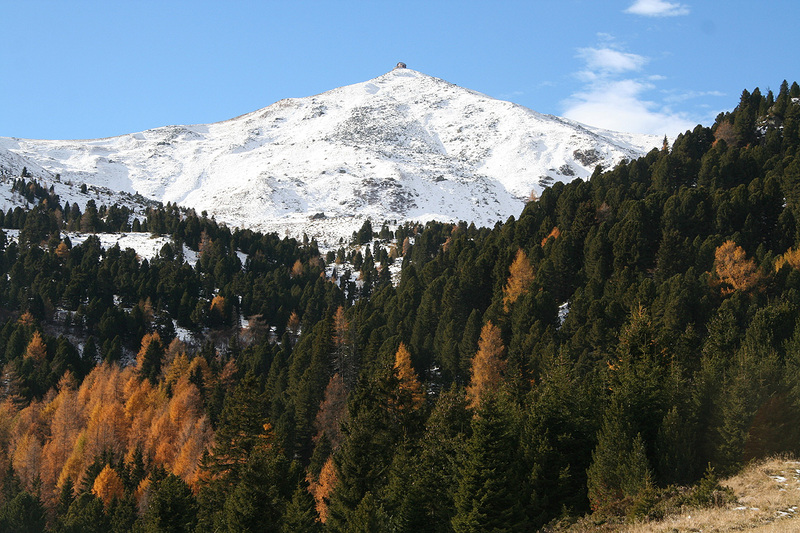 Zirbitzkogel as seen from the road to Sabathyhütte. Panorama I, the view is south. Panorama II, the view is west. 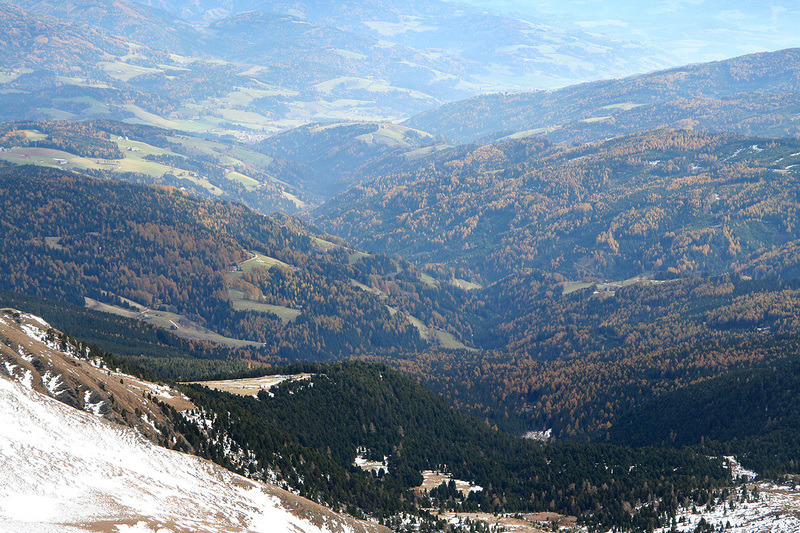 Panorama III, the view is north. Panorama IV, the view is east. Panorama V, the view is south.